Members of the community can enjoy a fun-filled day of activities that include station tours, touch a truck, the fire safety house, using a fire hose and a firefighter costume. Firefighters will show attendees how to use a fire extinguisher and review your home safety and home escape plans. Kids can welcome firefighters to their new home with sidewalk chalk drawings. Stock the Pantry at Fire Station No. 3! Your family can bring items to help stock the station's pantry. Some of the items needed are: sugar, cereal, coffee, snacks and macaroni and cheese. To view a complete list of the items needed click here. Follow the City's Facebook event page for more information about the event. Also, view the City's free parking map for places to park for the event. Specials at The Market in Avondale! 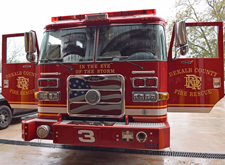 To help celebrate Community Day The Market In Avondale will be offering firefighter themed food specials and ten-percent off discounts to patrons wearing a red shirt or a shirt with the number three on it between 7 a.m. and 4 p.m.